For a lot of New Orleans musicians, the flood and forced depopulation of the city after Katrina was a slow motion train wreck that piled disaster upon disaster and either ended in tragedy or still hasn’t stopped. You didn’t have to die immediately in the flood to be killed by it. Some musicians and artists in other disciplines have managed to sublimate this tragedy into their work. Their art flourished even as their lives fell apart. It’s an old story, familiar to the people whose ancestors were brought here in chains or arrived as refugees fleeing religious persecution. 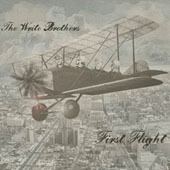 When all else fails, music has the power to sustain the spirit and bear witness to the horror of history. Songwriters need stories and much of the time it’s the story of their life that ends up getting told. A storyteller with a dull life doesn’t have much to work with. So a storyteller with a hard life is actually blessed. 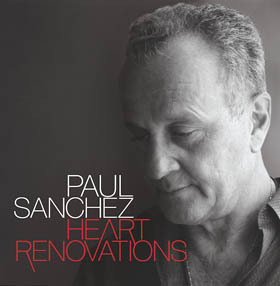 So it is with Paul Sanchez, whose seemingly endless trove of tales encompasses a world of grief and heartbreak, hope and redemption. A New Orleans story. It might be a hurricane, a death, the end of a marriage—it’s all material for a teller of tales who grew up studying the likes of Bob Dylan, Steve Goodman and Bruce Springsteen. "Sanchez pulls from a surprising mix of genres to create a unique singer-songwriter album that combines music and storytelling. 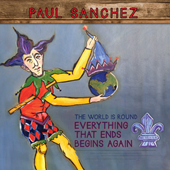 Sad tales, humor, pure entertainment, and hope are interwoven throughout twenty solo acoustic songs... "
At the Sheraton New Orleans Fais Do-Do Stage Friday, local singer-songwriter Paul Sanchez played with not one, but two bands during his one-hour set. The first was Minimum Rage, the all-woman band that took turns showcasing a variety of quirky roles — guitarist Sonia Tetlow sang a song about mobile food vendor Mr. Okra while drummer Linda Bolley fired off a guitar solo during a cover of Johnny Cash’s “Ring of Fire” while her feet kept beat banging the bass drum and high-hat cymbal. Bass player Mary Lasseigne stepped into the title role of “Maggie Don’t Two-Step,” a Cowboy Mouth song that got the crowd to do what they’re supposed to do at a stage titled Fais Do-Do: dance. Paul Sanchez knows how to bring the party at Jazz Fest. Holding down the mid-day slot (1:40 p.m.) Friday on the Sheraton Fais Do-Do stage, the popular local singer-songwriter surrounded himself with a whole lot of rockin' women. For the past century, New Orleans has been known as a place of great instrumentalists and great singers. The emphasis has been on live performance and there has been a virtual absence of music-industry infrastructure, particularly in the most lucrative aspect of the business, publishing. It’s not surprising that without a publishing business the art of songwriting was not well served. Paul Sanchez’s transformation from corporate rocker in Cowboy Mouth to one of the most distinctive New Orleans songwriters was among the happiest post-Katrina storylines in a city struggling to rediscover its identity. 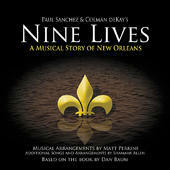 Sanchez made several excellent solo albums and collaborated with some of the city’s gifted songwriters and musicians in a collective creative renaissance that reached its apogee in the still-in-progress production of Nine Lives: The Musical. It has been eight years since Katrina, when the levees broke and New Orleans flooded. I’m not comfortable using the word anniversary with the flood– anniversary seems like it’s something we should celebrate, and no one I know wants to celebrate Katrina. 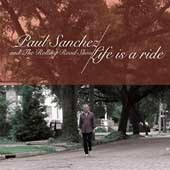 A professional musician for most of his adult life, Paul Sanchez typically spends his summers on tour. This summer, under normal circumstances, he would have also closely monitored the progress of "Nine Lives," the New Orleans-set musical he co-created, as it is developed for the Broadway stage. But this summer was anything but normal for Sanchez. In April, his wife of 20 years, Shelly, was diagnosed with breast cancer. She underwent a double mastectomy. With Shelly facing a long and difficult recovery, he couldn't stand the thought of leaving her to go on the road. So he swallowed his pride and called up an old friend who owns an office supply company.